Scores of bodies were discovered alongside luggage, a plane door and an emergency slide floating in the water 100 miles off the coast of Borneo Island earlier today after three days of searches. 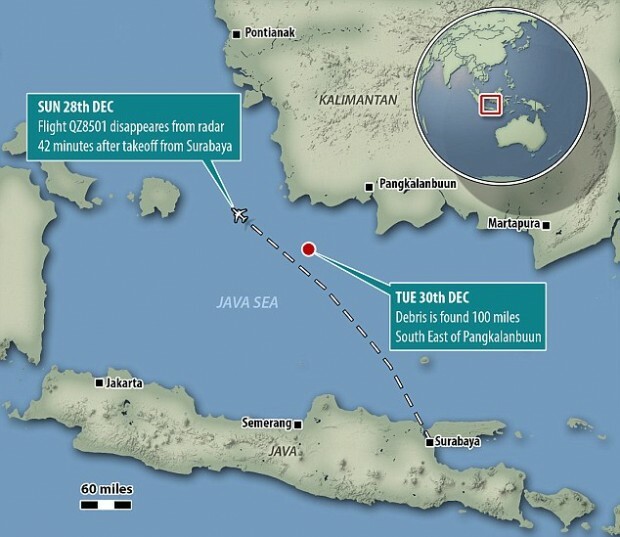 Officials have confirmed that bodies and debris found in Java Sea off Indonesia are from AirAsia flight 8501, and a naval spokesman said the rescuers remain ‘very busy’ retrieving the victims. The recovery of 40 bodies came as devastated relatives of AirAsia crash victims collapsed in grief and were taken to hospital after an Indonesian television station showed disturbing uncensored footage of the swollen corpses floating in the sea. Images shown on a news channel showed at least one body floating in the water, causing the victims’ relatives – who were watching live reports at crisis-centre at Juanda International Airport in Surabaya – to burst into tears, with some fainting and requiring hospital treatment. The Airbus A320-200 was 42 minutes into its flight from Surabaya in Indonesia to Singapore on Sunday when it vanished with 162 people on board.